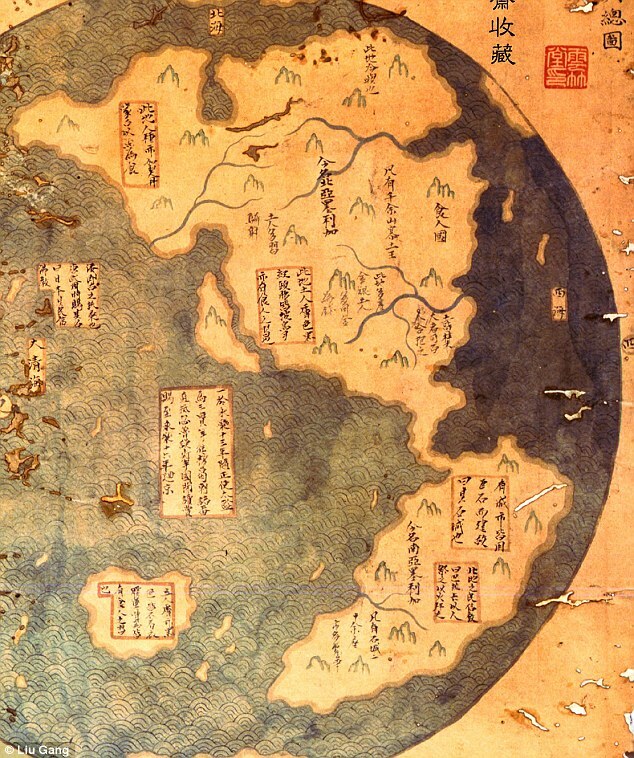 Does this map from 1418 prove historian’s controversial claim that the New World was discovered by the CHINESE 70 years before Columbus? A copy of a 600-year-old map found in a second-hand book shop is the key to proving that the Chinese, not Christopher Columbus, were the first to discover the New World, a controversial British historian claims. 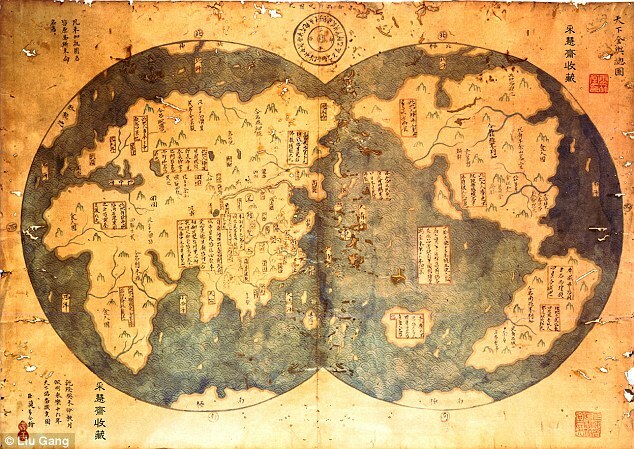 The document is purportedly an 18th century copy of a 1418 map charted by Chinese Admiral Zheng He, which appears to show the New World in some detail. This purported evidence that a Chinese sailor mapped the Western Hemisphere more than seven decades before Columbus is just one of Earth-shattering claims that author Gavin Menzies makes in his new book ‘Who Discovered America?’ – out today, just in time for the Columbus Day holiday. ‘The traditional story of Columbus discovering the New World is absolute fantasy, it’s fairy tales,’ Mr Menzies told MailOnline. Mr Menzies believes that this portion of the map depicts the Chinese mapping of North and South America in 1418 – showing major rivers. Among Menzies other claims are that the first inhabitants of the Western hemisphere didn’t come over land from the Bering Strait, but instead were Chinese sailors who first crossed the Pacific Ocean 40,000 years ago. 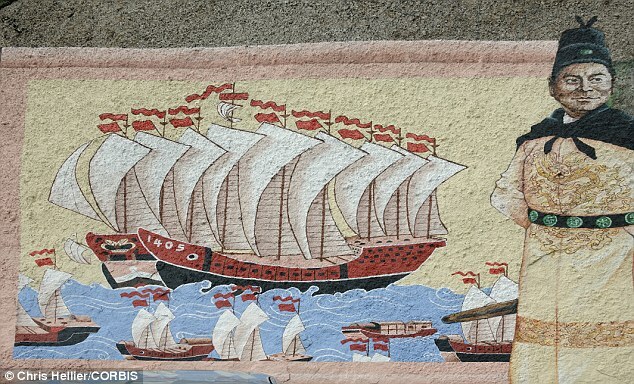 Furthermore, he says a majestic fleet of Chinese ships, commanded by Zheng He, sailed around the continent of South America – 100 years before Ferdinand Megellan supposedly became the first the undertake the task. 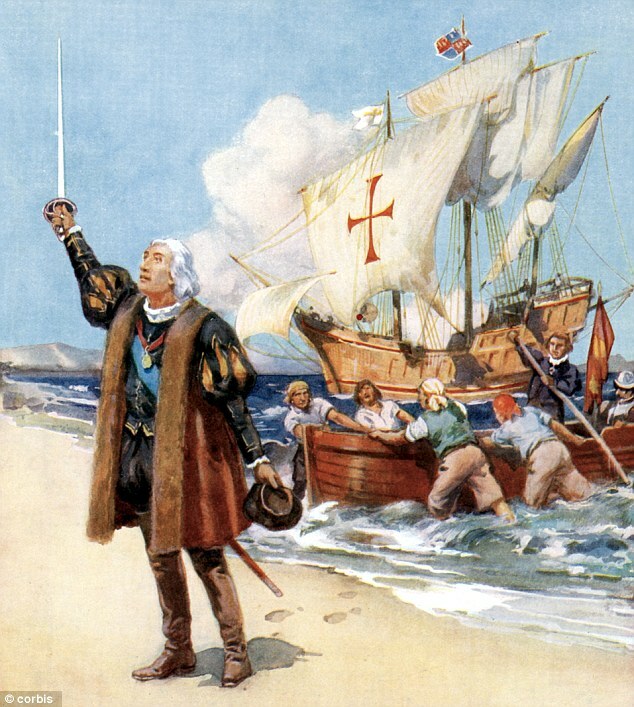 Columbus features heavily in the book – insofar as Menzies has devoted the last 20 years to finding and laying out evidence that Columbus not only didn’t discover America – he was 40 millenia late. Mr Menzies believes that Columbus actually had a map of the world that was plotted by the Chinese Admiral Zheng He, who created the map when he sailed to the New World in 1421, more than seven decades before Columbus. His book includes what Menzies says is a copy of that map. discovered by Beijing attorney Liu Gang in a second-hand bookshop that he says proves his theory. The document, he says, is an 18th century copy of Admiral Zheng He’s 1417 map. Mr Menzies argues that it clearly shows North American rivers and coasts, as well as the continent of South America. Mr Menzie’s assertion about Zheng He’s voyage to the New World isn’t new – he first wrote about it in 2002 – but the map is. Mr Liu had the map authenticated by an appraiser from Christie’s Auctions, who said that the document was ‘very old’ and was not a newly-made fake. After Mr Liu brought the map forward, Menzies also had a team of historians analyze every word on it. He concluded that it was originally written in the Ming Dynasty – a Chinese period that lasted from 1368 to 1644. 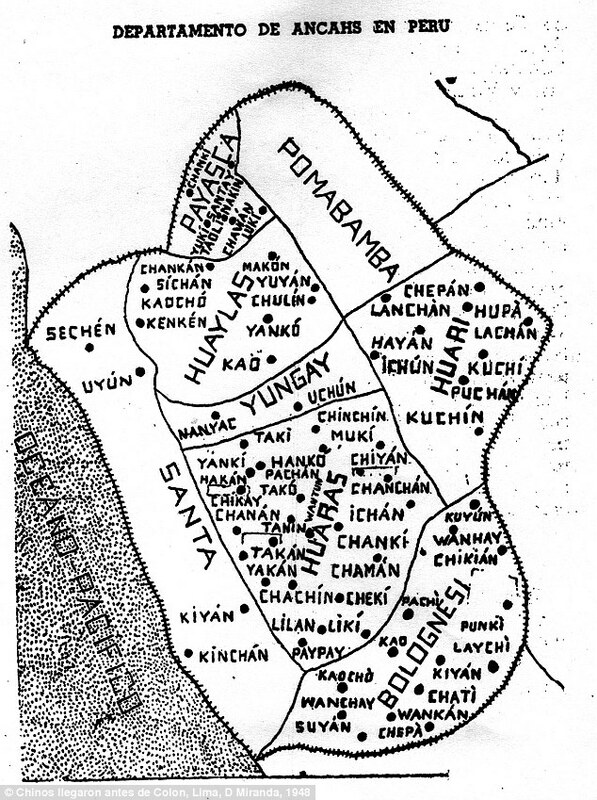 In the region of the map that Mr Menzies believes refers to Peru are written the inscriptions – ‘Here the people practiced the religion of Paracas’ and ‘Here the people practice human sacrifice’ – clear references peoples known to have inhabited Peru at the time. 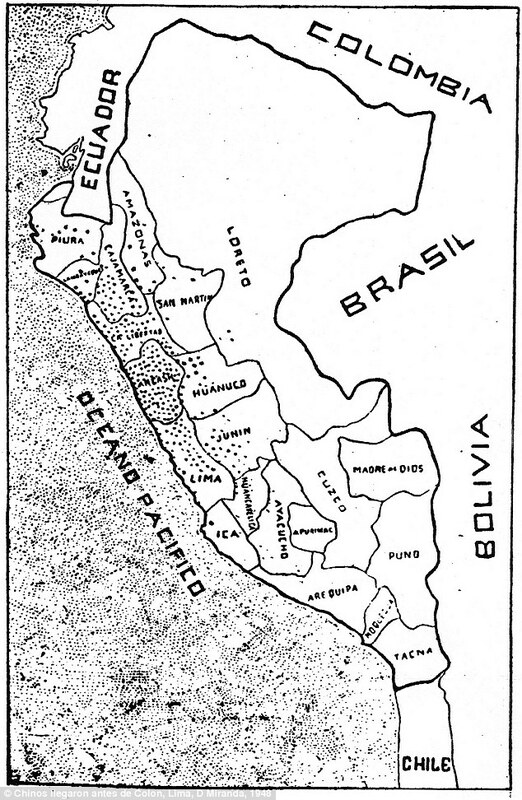 The map is further corroborated, Mr Menzies says, by the Chinese names of numerous towns and regions in Peru. 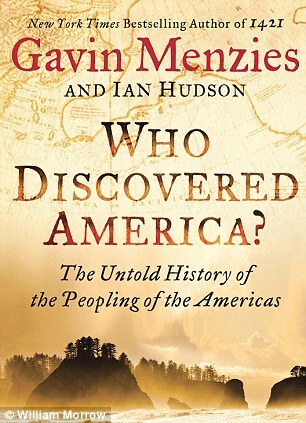 ‘Who Discovered America?’ is Menzie’s fourth book in which he tries to re-write history and orient it East. 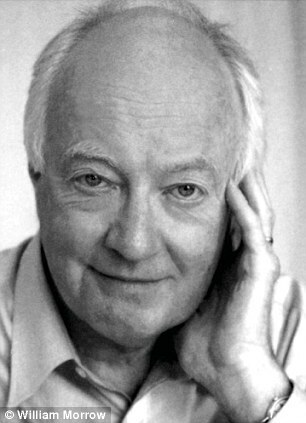 He has plowed millions of dollars of his proceeds from his books into continuing his world-traveling research into his theories. He has turned his north London home into a de facto research institute, employing up to six research assistants at a time. That has not stopped him from gaining millions of readers – and thousands of followers who contribute to his website and contribute research of their own. Mr Menzies debuted his Asia-centric theories with 2002’s ‘1421: The Year China Discovered the World.’ In it, he said that the famed Chinese sailor Admiral Zheng He, who is known to have reached Europe and Africa, also crossed the Pacific Ocean to the Western Hemisphere. He claims that Zheng He not only reached the New World, he left colonies there. His fleet also sailed around the tip of South America – through the Strait of Megellan around the Gulf of Mexico and up the Mississippi. There is evidence, both archaeological and genetic, Menzies says, that Zheng He left his mark in California, Florida, Virginia and even the Outer Banks of North Carolina. In ‘Who Discovered America?’ Menzies focuses on theories that Asians also made it to North and South America by sea long before even Zheng He. ‘It appears certain that man reached the Americas by sea at least forty thousands years ago,’ Menzies writes. Most scientists believe man first widely populated the Western Hemisphere 13,000 to 16,500 years ago. The almost universally-held theory among academics is that man came to the New World by crossing the Bering Strait land-bridge between Asia and North America. Mr Menzies says the idea that man was able to cross the Pacific Ocean around 40,000 BC isn’t nearly as dramatic as it seems.